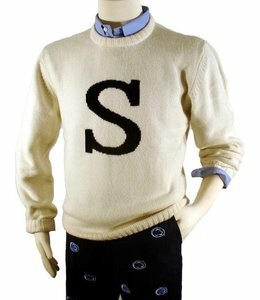 Home Navy Lambswool Sweater with Navy"S"
Smart Turnout Navy Lambswool Sweater with Navy"S"
An American Classic, our Collegiate Sweater is made to reflect the timeless look of Penn State University. Made from Wool in Authentic PSU Colors and Featuring Bold College Letter "S" on the Front. A must-have classic for the big Penn State fan. 100% Lambswool. Made in the U.K. Ivory White with Navy "S" or Navy with Ivory White "S". Ivory White with Navy "S" is perfect for Blue & White Outs!